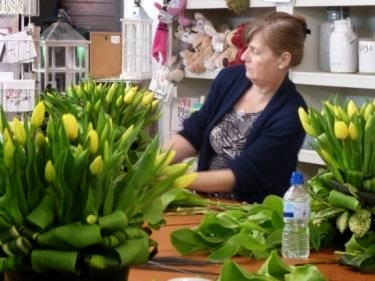 Bye-Bye Spring, Hello Kendalls' Summer Floristry Workshops! Spring is arguably the most exciting season in the floral calendar, when the ground suddenly bursts into life. So it was wonderful to celebrate nature’s abundance at the Kendalls Spring Workshops. At the Kendalls floristry workshops in April, we created ‘Spring Hand Tied’ floral arrangements using a selection of pretty and scented spring flowers and a 'Spring Contemporary’ creations full of beautiful yellow tulips. "Lovely flowers, good company and great cake!" "Very welcoming and enjoyable evening I couldn't believe what I made! "Lovely group of ladies and instruction from Louise was excellent"
"Friendship and flowers - what better!" As we say goodbye to Spring, it’s now time to welcome in Summer! 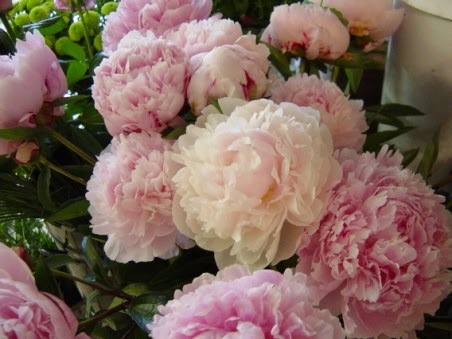 Here at Kendalls we’re very excited about the prospect of sunshine, flip flops and Pimm's, but we’re even more excited to announce three Kendalls Summer floristry workshops ‘Peony Hand Tied’ on 12 and 19 June and ‘Perfect Summer Blooms’ on 26 June. Both courses will be taught by our expert tutor, Louise Wilkes, owner of Kendalls Florist, who will demonstrate step-by-step how to create a professional floral arrangement and help you create something that will be sure to impress your friends and family. Find out more about our Summer courses. St Albans City and District Council is to trial a new cardboard collection service in selected areas to run alongside the current kerbside recycling. The trial follows constructive feedback from residents about the Council’s recycling scheme. The scheme was changed last year with the aim of helping to increase household recycling rates above 60%. If the trial is successful, the service will be rolled out across the District and will make it easier for residents to recycle cardboard. Residents will then no longer have to break down large pieces of cardboard to fit into their paper recycling boxes or request a special large cardboard collection service. At a meeting on Thursday 24 April, Cabinet heard that the Council’s waste collection contractors Amey will test the new service from mid-May until the end of June. The service will involve dedicated cardboard and paper collection vehicles that will be used to take residents’ cardboard and paper on their recycling collection days. The trial will take place across 12 collection rounds that have yet to be agreed. Once details are finalised, the information will be posted on the Council’s website and residents affected will be notified. Subject to the trial being successful, Amey will roll out the new service across the District during the summer. The Council is currently running a special post-Easter cardboard collection service until Friday 2 May. This is because it is a time of year when a lot of cardboard is generated, for example from home improvement projects. Residents should put cardboard in their recycling box with paper or flatten larger pieces and stack them alongside for collection on their first recycling day after Easter. Details of waste and recycling collections following Easter are available here. If residents miss this one-off collection, they can place cardboard in their paper recycling boxes. Alternatively, they can book a special collection for oversized cardboard during their normal recycling week by calling 01727 819285 or email wastemanagementservices@stalbans.gov.uk. Last year, the Council asked residents to remove cardboard from green waste as part of its recycling scheme to help increase household recycling rates to above 60%. This is because national standards for compost have tightened recently and the cardboard was contaminating green waste making it unusable as compost. When green waste is contaminated with cardboard, it is rejected by the composting plant and has to be sent to landfill. The Heritage Lottery Fund (HLF) has given permission for work to start on the project to transform St Albans grade II* Town Hall into a museum and gallery. The HLF has pledged £2.8m and St Albans City and District Council £2.25m towards the total project cost of £6.75m. St Albans Museums and Galleries Trust (the Trust) is leading fundraising for the remaining £1.7m, supported by the Council’s museums service and the University of Hertfordshire. The fundraising project is called “renaissance: St Albans”. Last year the HLF awarded first phase development funding of £282,000 for the project which will see the Museum of St Albans move to the Town Hall. Work could not start on the partnership project until the HLF approved detailed plans for this first phase. The Council will now proceed to appoint a project manager, an architect and an exhibition and interpretation designer. They will develop the designs and long-term project plans needed to support a second-round application to the HLF for the balance of its £2.8m pledge. At a meeting on Thursday 24 April, Cabinet will hear that a number of specialist national architects’ practices have shown an interest in leading the design team. Fundraising is being led by the Trust. A number of donations and pledges have been received, including from both the St Albans University of the Third Age and St Albans Civic Society. The community fundraising programme will be launched in June. The Council is working with various partners, including the Trust and the University of Hertfordshire Galleries to transform the beautiful Town Hall into a must-see attraction. The museum and gallery will also provide a cultural heritage resource for the region. Visitors will be able to discover 2,000 years of St Albans history through innovative and inspirational displays and tour the Town Hall’s court room and prison cells. The Town Hall will also provide space for the University of Hertfordshire’s contemporary art gallery currently located with the Museum of St Albans in Hatfield Road. The aim is that the Town Hall will become a gateway for exploring other attractions in the City. These include Verulamium Museum, the Cathedral, the Roman Theatre and the medieval Clock Tower. An update on the museum project is available in the papers for the meeting on Thursday 24 April here. Changes are being made to charges at car parks to make the most of available capacity, helping workers and visitors to St Albans. The new charges come into effect at car parks owned by St Albans City and District Council from 1 April. They are designed to encourage the use of particular car parks by leisure users, workers or shoppers. It means that the charges will now vary between car parks managed on behalf of the Council by NCP under its new contract. At NCP car parks elsewhere in the City and at the Civic Centre, it will cost £10 for all-day parking. Leisure users and shoppers will still be able to use the Council-run Westminster Lodge car park free of charge for up to two hours. They will also be able to park on Sundays for £1 at the Council’s NCP car parks and at the Council-run Civic Centre car park (accessed from Bricket Road, St Albans). This will mean that on Sundays the City centre car parks normally used by visitors will have the same £1 charge. This will allow us to promote shopping in St Albans more easily. The charge also compares favourably with surrounding areas. The new contract with NCP also provides for improvements to car parks. Brighter LED lighting will be installed at Drovers Way and Russell Avenue, helping to improve the safety of customers. A Pay By Phone service is also being introduced at all NCP car parks, making it easier for customers to pay for parking. This will complement the Pay By Phone service introduced in August last year in relation to off-road and on-street parking. The Council has also reviewed the cost of parking permits and is introducing a 2% increase. For a resident’s all day permit Type B this equates to an increase of 76p to £38.76. Come to a fun, family event on Saturday 8 March and contribute ideas on what to include in a new street art community mural for the Alban Way. You can take part in creative activities, get your bike safety checked and learn about the old railway that once ran along the Alban Way. Provided by St Albans City and District Council and Sustrans, the event will take place from 12 noon to 3pm at the Alban Way entrance on Orient Close. Young people from the Cunningham Hub Youth Café will be present to gather ideas for a mural they are creating to decorate the tunnel under London Road. Accompanied by a professional artist, they will be asking passers-by how they use the Alban Way as inspiration for the mural. During the afternoon, there will also be an eight mile, off-road bike ride for families along the Alban Way to the outskirts of Hatfield. Before setting off, cyclists will be able to test their pedal power by making a healthy drink on a specially adapted ‘Smoothie bike’. Dr Bike will also be on hand to carry out bicycle safety checks and simple maintenance. The event is being organised in partnership with St Albans Arts, Sport & Health, the development arm of Leisure Connection and other partners in St Albans District. Come and play detective at a Murder Mystery event at Verulamium Museum on Saturday 22 February and solve the murder of the curator. Hobby detectives will get to interview museum staff acting out roles from Cleaner to Director, to find out who murdered the fictitious museum curator ‘John Mortis’. The curator is responsible for looking after the museum collection and displaying it to the public. The event runs from 11am to 4pm and is open to anyone aged 7 years and above. You can play detective on your own or pool your resources as a couple or family group. It costs £5 to participate in the event, either as an individual or a group, plus admission to the museum. Please note admission to the museum is free to St Albans residents. Participating groups and individuals will be given an inspector’s badge and have the opportunity to enter a verdict in a prize draw to win a detective game. For further information please visit www.stalbansmuseums.org.uk or phone 01727-819340.